Viewing topic "Motif XF6 for sale"
Mint condition XF6, too advanced for my usage.. Location ACT. Please PM me if interested. Do not get rid of your Motif, you will not find another keyboard that has better sounds. You just need to get the basics under your belt. This is a prime example of the grass not being greener on the other side of the hill. 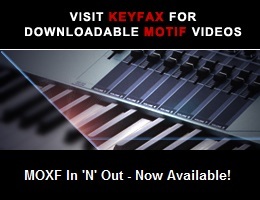 Motif xf6 is the best stage keyboard on the market, but you need to understand the file storage management really well!